The park lies at the eastern end of Harrold village but is actually within the parish boundaries of Odell. It is a wonderful amenity shared by the people of North Bedfordshire, and visited by people from far beyond the county boundaries. It consists of an area of water meadows and lakes adjacent to the River Great Ouse and was built on the site of former sand and gravel workings. It has a total area of 58.7 hectares, including 12.3 hectares of water meadows and 45.1 hectares of lakes. At the Harrold entrance in Carlton Road there is a visitor car park and Teazels Café and there are interpretative facilities within this building. A bridleway and public footpath cross the site from west to east providing attractive routes, on either side of Grebe Lake, from Harrold to Horsefair Lane in Odell. In 2002 work was completed on the resurfacing of the footpath around the northern shore of Grebe Lake. Until the Second World War the site consisted of open farmland, the southern parts of which were subject to fairly regular flooding. After the war planning permission was given for the extraction of sand and gravel. In accordance with the planning permissions imposed, the site was restored as a series of lakes, which rapidly acquired importance as wildlife habitats; a small woodland was planted between Carlton Road and the gravel workings. Work finished on the restoration of the lakes in 1980. The farmland to the north and some of the woodland was sold to a local farmer in 1981, and the rest of the site was purchased by Bedfordshire County Council in March 1982. The Council had already purchased the river meadows in 1979. 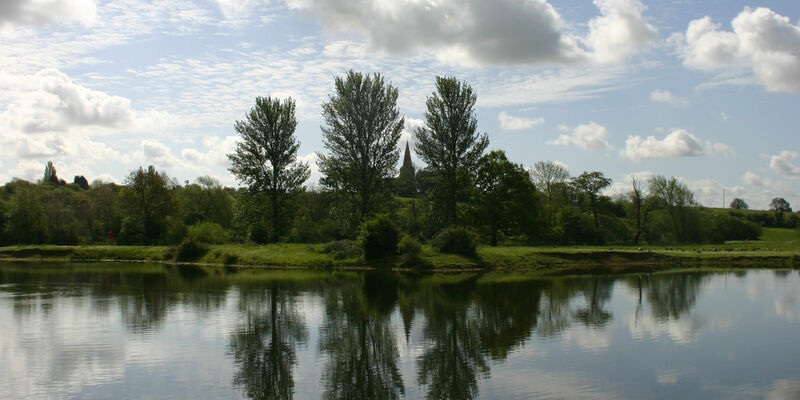 The purpose of the Country Park is to provide an area of informal recreation and nature conservation. From 1982 to 1985 the Country Park was sympathetically developed by the Arts and Recreation Department. Bridges were put across watercourses and gates and stiles were erected, all to allow access to areas of the park. In May 1986 work started on the Visitor Centre, toilets and a new car park, and was completed by December. Summer 2006 saw two exciting new developments for the young people of Harrold a cycle and kickwall facility. These were provided with finance from the Parish Council and with the kind support of the Country Park where they are both located. Both can be easily found and accessed just inside the Country Park just along from Teazels Cafe and the Rangers Visitor Centre. The cycle mounds are just next to the cafe, they offer exciting challenges to cyclists of all levels. A little further on from the cycle mounds can be found the kickwall. This is a tarmaced area with a practice goal two, sprung walls to kick against and a basketball hoop. There is disabled access and the basketball facility has proved to have very wide appeal. More recently the very popular skateboard park attracts enthusiasts from near and far. Young visitors are also attracted to the two exciting play areas (on the Harrold side of the lake and near the Horsefair Lane entrance from Odell).